WR-1 Receiver can be paired with the WT-1 for a full wireless kit (available together here) is ideal for placing between sources or subs and amps. Earn 35 loyalty points when you order this item. 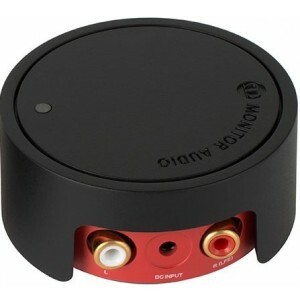 Monitor Audio WT-1 wireless transmitter features a compact module design. It can be used with WR-1 to create a simple wireless zone extension or to enable wireless rear speakers in a home theatre system. 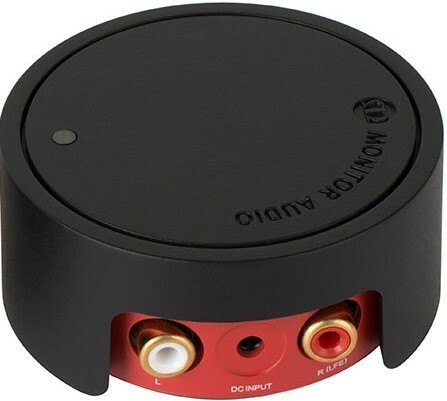 The WT-1 can be used in conjunction with the WS-10 subwoofer to create a wireless sub-woofer system for use with any AV receiver or amplifier with LFE or stereo outputs. This module is ultra-compact and can be hidden out of sight a the back of an equipment rack, amplifier or TV. Once the modules are switched on, they will automatically lock on to each other and connect. A non-slip silicon rubber base is designed to not mark or leave residue on surfaces. WT1 is designed and approved to ErP standards and complies with Eco design for energy related products Regulations for Energy-Related Products Directive meaning the unit consumes less than 0.5 Watts of power in standby mode.